The River Sheaf must also feature in our story. For without it, there would be no mill. Many hundreds of years ago, when the country was still being settled, conquerors needed permanent ways of marking the boundaries of their territory; where possible, they chose rivers or streams, as they could not easily be moved. It seems amazing that such a small body of water as that flowing through our park, could once have formed the boundary between the two kingdoms of Mercia and Northumbria. Until the seventeenth century, the nameSheaf was written Scheth, or Sheath. One of our local historians tells us thatSheaf is a computation of shed and sheth, meaning to divide or separate. Locally, this boundary ran along Limb Brook, which joins the Sheaf just above Abbeydale Works dam, then some 2½ miles down the Sheaf to Heeley bottom, where it turned right to follow up the Meersbrook. Till the twentieth century, this was also the boundary between Derbyshire and Yorkshire. The earliest written record regarding this area is an entry for the year 829 in the Anglosaxon Chronicle, which refers to the submission of King Eanred of Northumbria to King Egbert of Wessex at the hamlet of Dore. 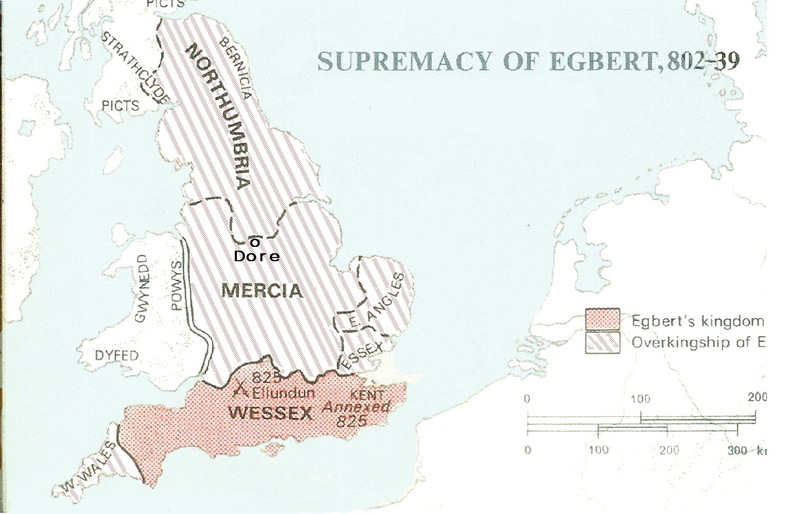 Once Egbert had conquered Mercia, he “led an army against the Northumbrians as far as Dore, where they met him, and offered terms of obedience and subjection, on the acceptance of which they returned home”[i]. This event made Egbert the first Saxon to claim to be king of all of England. A glance at the map shows that Egbert seems to have chosen the spot for the signing of, what came to be known as the “Treaty of Dore”, quite carefully. The hamlet is within half a mile of the most southerly extent of the border between the two kingdoms and roughly half way between the mouths of the Mersey and the Humber; one can imagine how intimidating it must have been for the Northumbrians to see the opposing army encamped on the skyline of Totley moss. The local topography was ideal for operating water mills, as the Sheaf falls 400 feet (c. 120 meters) over six miles; in its heyday, serving 28 mills, used for such varied purposes as making flour, fulling cloth, smelting lead, making paper and various secondary metal working trades.